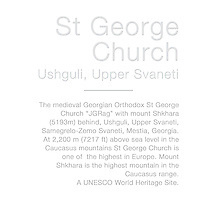 Pictures & images of St George Georgian Orthodox Church, Ushguli, Upper Svaneti, Georgia (country). One of the iconic views in Georgia is the tiny St George medieval Church “JGRag” set against the permanently snowy slopes of mount Shkhara (5193m). The small stone Georgian church of St George has a single naive leading to an apse at the eastern end. The church is surrounded by a wall with a stone house for the priest with its own Svaneti defensive tower house. 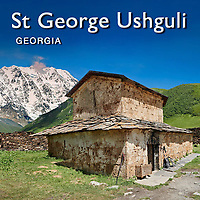 St George Church, Ushguli, is situated at over at over 2,200 m (7217 ft) above sea level in the Caucasus mountains and is one of the the highest church with a full time priest in Europe. For 6 months of the year Ushguli is cut off from the rest of the world so the Church of St George serves only 200 residents who are snowed in for the winter. It is hard to image how Ushguli came to be built in such a remote and harsh environment, yet even harder to imagine how people survive permanently there. It is hardly surprising then that people who lived so close to nature would be superstitious and religious. Christianity became the official religion of Georgia in the 4th century making it the first Christian country in the world. Later Christianity was spread to the remote areas of Georgia by the missionaries Thirteen Syrian Fathers. In the remote areas like Ushguli pagan rituals were hard to destroy and even today pagan practises are still held by locals as can be seen by decapitated sheeps heads and rams horn crosses found in the area.